Home > Publications > Factsheets and resources > Are you being squeezed for a debt? Even if you don't agree with how much you owe or don't think you owe the money, you should do something. This brochure explains some of the legal steps to take if you are in dispute about amounts under $100,000 in the Local Court. 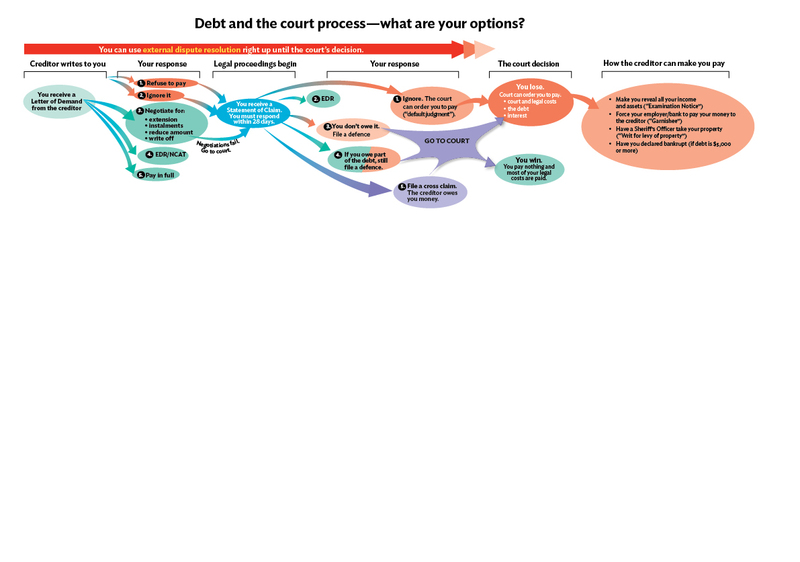 Debt and the court process - what are your options? This is a letter or notice from the creditor (the person/company who says you owe money) which demands that you pay a set amount by a certain date or court proceedings will be started. A letter of demand is not from the court. When you get a letter of demand, check the amount is correct. If you disagree with what it says you owe, or there are not enough details, write a letter (and date it!) to the creditor asking for a detailed statement of money owed. Keep copies of all your letters. If you are uncertain what to do, contact one of the services listed on the back of this brochure. If you owe the money but can’t afford to pay it all back at once, try to negotiate with the creditor. When negotiating with a creditor, only agree to make repayments that you can afford. Some money disputes with businesses can be resolved through external dispute resolution (EDR) schemes. There are many EDR schemes and they apply to all banks, credit providers, insurers and to many energy and water providers, internet and mobile phone companies. For example, all banks and insurers are members of the Financial Ombudsman Service (FOS). If the business you are in dispute with is a member of an EDR scheme, then you can take your dispute to that scheme. EDR is free. EDR determinations bind the business you are in dispute with, but do not bind you. If your dispute is with another person, you can try the free mediation service at your local Community Justice Centre. If your dispute relates to consumer goods or services or is about renting your home, you might be able to apply to NSW Civil and Administrative Tribunal (NCAT). This is a cheaper alternative than court. If you need more advice, call LawAccess NSW or see a lawyer about alternatives to court. because your creditor can then begin legal proceedings and you will have to pay the legal and court costs if you lose in court. If informal negotiation does not work there are some alternatives to court for you to consider. EDR - Some disputes (especially those with companies) can be resolved through EDR. For example all credit providers must be in either FOS or Credit Investment Ombudsman (CIO). EDR schemes can also resolve disputes about financial hardship. NCAT - Most consumer disputes can be dealt at NCAT. This is easier and cheaper than going to Court. If you receive a Statement of Claim you must do something— don’t ignore it! This is a document issued by the Local Court. It means the creditor has started legal proceedings to recover money from you. If you receive a Statement of Claim, you have 28 days from the date you received it to file a response with the Court or lodge in EDR (if applicable). If your debt is with a bank or even a debt collector acting for a finance company, use EDR before the Court makes its decision. Court action is stopped while you are in EDR. If you ignore the claim, the Court will order that you owe the money to the creditor. This is called a “Default Judgment”. If you say you don’t owe the money you can file a defence. You have 28 days from service of the Statement of Claim to file this with the Court. 4. Agree to pay all or part of the debt. If you agree to all of the debt, you should pay it and the filing cost. If you agree to part of the debt but not all, you must still file a defence. You cannot confess just to that part of the debt. You should get legal advice before you do this. claiming that the creditor owes you money. If you take any of the above options, (3, 4, and 5) you will have to file a form in the Local Court. You should do this within 28 days. defend the Statement of Claim but you lose. The costs of the creditor’s lawyers will then be added to the debt and can be very high after a defended hearing. If the Court makes an order that you must pay a debt, the creditor is called the “judgment creditor” and you are called the “judgment debtor”. When the order is made, “judgment” is given against you. This order remains in force for at least 12 years. This means the judgment creditor has at least 12 years to take further action to recover money owed by you. The Sheriff’s Officer cannot force entry to your home but if denied entry, can obtain a court order to enter your premises. For debts of $10,000 or more, a writ can be issued over “real property” (eg your home), to satisfy the debt. If the judgment debt is $5,000 or more, the creditor can apply to the Federal Court to have you declared bankrupt. If you receive a Bankruptcy Notice you should seek advice from a lawyer immediately. Negotiate a repayment arrangement - make sure it is in writing. If you owe someone money, you should do something about it. You have a right not to be harassed even if you are being pursued for debt. If your dispute is with a credit provider and you are experiencing financial hardship, call the credit provider or lodge with an EDR scheme, asking for a ‘hardship variation’. Debt collectors and companies must comply with the Australian Securities and Investments Commission (ASIC)/Australian Competition and Consumer Commission (ACCC) Debt Collection Guidelines. You can complain to ASIC or ACCC about a company or debt collector who is harassing or intimidating you in relation to a debt. Remember, in NSW, no one goes to prison just for owing money. Call LawAccess NSW on 1300 888 529 for help over the phone, or your nearest Legal Aid office to arrange a free advice interview. assist people with debt problems.